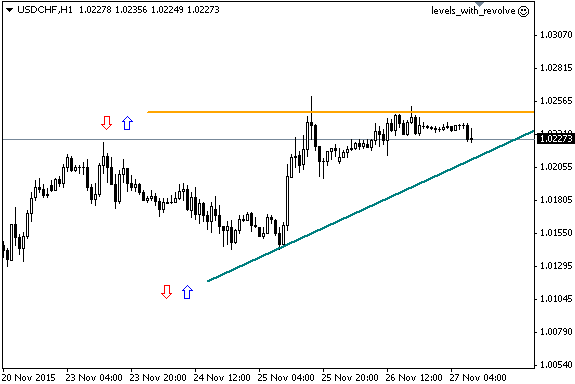 EA opens trades from support and resistance levels (trendline — element from a toolbar) which were set by a trader. The direction is selected by the arrows, graphically. EA revolves the deal if an opposite signal (from another level) appears. Trade the move from the levels (arrows — up and down). If the open price is under the level, the EA will open the sell position when price crosses the level. The buy position has the opposite condition. Trade the crossing the levels (↕). If the open price is under the level, the EA will open the buy position when price crosses the level. The sell position has the opposite condition. Levels have different colors, according to their angle. Levels is “off” if inappropriate arrows were set. In this case the level is thin. If you want to make a horizontal level, move its second handle to the left from the first handle.